Schkofleski, Edward ; Updegraff, Martin G. ; Harvey, William A ; Grant, Irene M.
Received for record this 24th day of April, 1919. [signed] Wm. A. Harvey Deputy County Clerk. 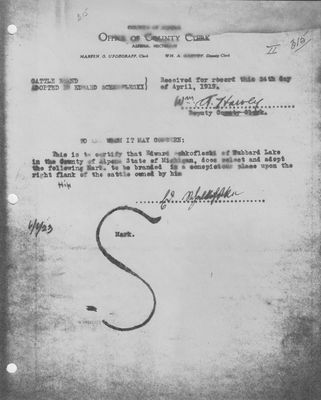 This is the certify that Edward Schkofleski of Hubbard Lake in the County of Alpena State of Michigan, does select and adopt the following Mark, to be branded in a conspicuous place upon the right flank of the cattle owned by him. Received for record this 6th day of June, 1923. This is to certify that Edward Schkolfleski of Hubbard Lake, in the County of Alpena State of Michigan, does select and adopt the following Mark to be branded in a conspicuous place upon the right hip of the cattle owned by him.